This is an ongoing series of articles on Winglets which track the histories of Canadair Regional Jets. C-FCRJ was the first Canadair Regional Jet built. After roll out, the aircraft spent its service life testing the capabilities of the program and changes made before they were applied to other aircraft in the fleet. The aircraft was painted in a single colour scheme, that being the original CRJ program house colours. It never left the Canadair, now Bombardier, aircraft fleet and was not operated in airline service. The aircraft was lost during a flight control test over Wichita Kansas on July 26th, 1993. 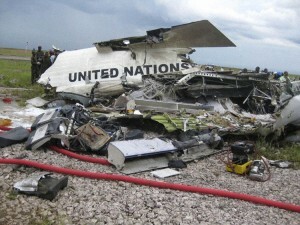 Three crew were lost in the accident and the aircraft was completely destroyed. The aircraft was on a test flight out of Wichita, Kansas to evaluate flying qualities in a new 8 degree takeoff flap setting and to demonstrate compliance with US 14 CFR 25:177 rules. The aircraft lost control during a low speed steady-heading sideslip test manoeuvre at Flight Level 120. The crew were to end a Steady Heading Sideslip (SHSS) manoeuvre at a 15 degree sideslip, but continued to 21 degrees at full rudder. The plane rolled rapidly through 360 degrees and entered a deep stall. As it descended through 8000 feet the captain ordered the co-pilot to deploy the anti-spin parachute, which he complied with. The co-pilot however, didn’t close the jaws (which connect/disconnect the parachute from the airplane) before chute deployment. The parachute fell free of the plane. Control was not regained and the aircraft crashed and skidded for about 200 yards through several cornfields.